The Butler volleyball team celebrates following a play during the Top Dawg Challenge. The team is now 1-5 on the season after picking up their first victory. Photo courtesy of Jimmy Lafakis. The Butler University volleyball team went 1-2 at the Top Dawg Challenge on Aug. 30 and Sept. 1 at Hinkle Fieldhouse. The matches were Butler’s first three home contests of the year. After falling to Auburn University on Friday night, the Bulldogs split a pair of games on Saturday against Eastern Illinois University and Illinois State University. Butler fell 25-23, 25-19, 25-18 to the visiting Tigers on the first night of the tournament. Sophomore outside hitter Natalie Ravenell led the Bulldogs with 12 kills, while senior setter Maddie Freiwald tied a match-high with 30 assists. The Bulldogs recorded 33 digs in the match, as opposed to Auburn’s 25. 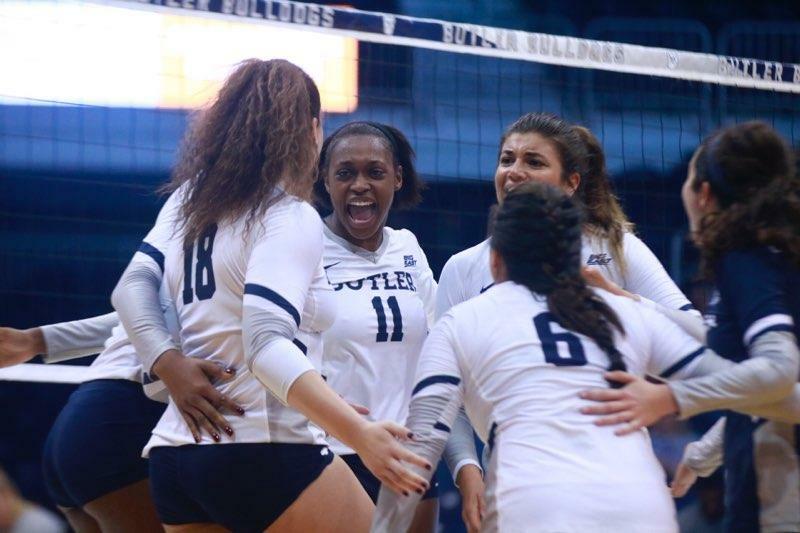 Butler swept the Saturday matinee, defeating the Panthers 25-18, 25-18, 28-26. Junior setter Megan Ramseyer posted 32 assists, nine digs, five kills and a block in the win. Senior middle blocker/outside hitter Bri Lilly hit .412 and recorded eight kills off 17 attempts, with just one error. Lilly recorded team-highs in kills (nine) and blocks (six) as the Bulldogs fell 25-19, 25-15, 25-18 to the eventual champion Redbirds on Saturday night. Junior middle blocker/outside hitter Brooke Gregory posted seven kills, while sophomore outside hitter Shay Horn added six kills of her own. Freshman defensive specialist/libero Elizabeth LaBue was named to the Top Dawg Challenge All-Tournament Team following Saturday night’s match after averaging nearly 10 digs per game over the weekend. The Bulldogs will hit the road to participate in the Arkansas Classic on Sept. 8 and 9.